Lois and Jonathan pay a visit to the Other Lois' apartment. 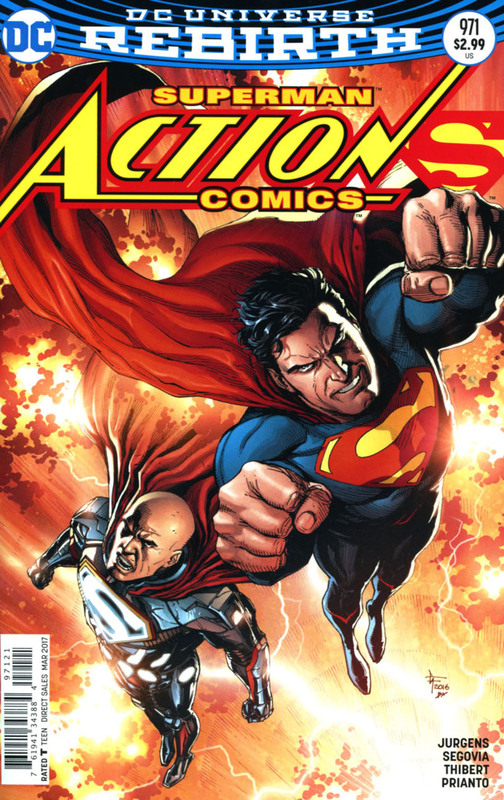 Meanwhile Superman helps Lex break free from his death sentence but their escape is stymied by L'Call. Lex and Superman crash land on a planet with a red sun, which means Superman is going to gradually lose his powers. 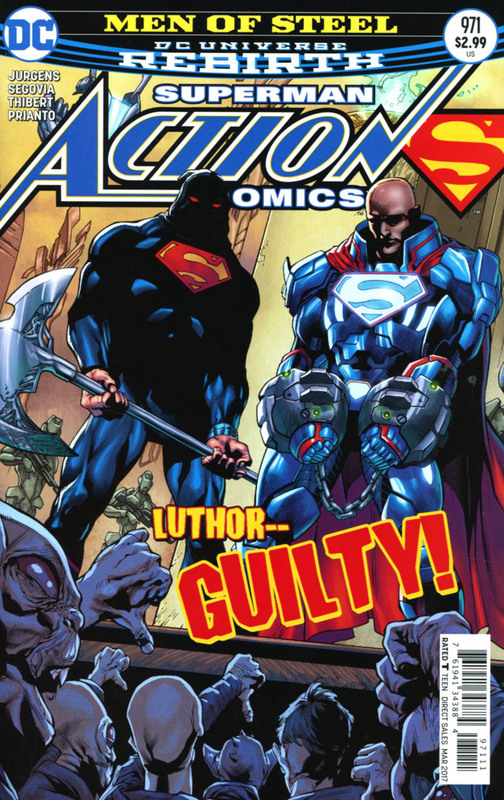 The men talk about Superman's suspicions and Lex explains why he had a change of heart. L'Call and Zade arrive and Lex tells them that the only way to hurt Superman is to get through him. Back in Metropolis the Other Clark Kent arrives at Lois' apartment. Story - 5: Lex Luthor is a bad guy. That's what I keep telling myself. Unless it's Earth-3, Lex Luthor is always a villain. That is the natural order of things. So why am I buying into this Lex's story of redemption? The answer is Dan Jurgens. He's making that happen. The way he writes the character and explains his change of heart allows me to buy into the fact that this Lex might be on the level. The inner monologue that was running through this issue certainly helped with that. It shows that deep down this Lex believes he is trying to turn around and his conversation with Superman certainly lent credence to the idea. While I loved the action of the first part of the issue it was that middle part that I liked the best. Two men trapped on a world with a red sun and having to work together despite one of the men thinking the other to be a villain. This sort of thing has been done before but Jurgens put a nice spin on that classic and made me care about the Lex. I want to see him succeed. I want him to become the hero and that is something I thought I would never write because I'm a big believer in villains staying villains. It makes me wonder if that's the long game here. Lex legitimately turns good but eventually falls to the dark side, so to speak. Having him make that change and then backslide would be so much more dramatic than having him reveal that playing the hero was his plan all along. The rest of the issue was just a joy to read. Superman's fake out at the beginning was a solid payoff to the cliffhanger of last issue. I also like that Lex recognized that this Superman is different than the one he is used to. The "quicker to act" line made me smile mainly because that's what I have been saying since the Pre-Flashpoint Superman returned. It's been nice to have a Superman that does something even if that something might be the wrong decision initially. It's better than sitting back and waiting until the last minute. The scenes with Lois and Jonathan were fun as well. The dialog felt natural and once again we get hit with a great cliffhanger with Other Clark Kent showing up. This title has not hit a slow spot yet and after seeing the solicitations I know that there's plenty of momentum to keep that going. Other Clark Kent. I love how sinister this is being played or at least how I'm reacting to him. Is he a non-powered clone? Something else? I can't wait to find out. Art - 4: My only nitpick for the art in this issue is the size of Superman's "S". Yeah, I know...it's extremely pedantic but the "S" looked too small on his chest. I don't have any complaints other than that. The page layouts were great. The storytelling was spot on. You would think that with the rotating artist teams that this book would feel disjointed but it doesn't. The styles are different but they mesh well together. Cover Art - 5: This cover reminds me of covers from the Silver Age where something crazy was going on that tied into one of the stories but was mostly there to grab the reader and get them to buy the issue. Superman as an executioner is not a new idea but this is an amazing version of it. Also, when I read the word, "Guilty!" I always hear the council from the beginning of SUPERMAN: THE MOVIE. Seriously. Try it. It makes the cover more awesome. Variant Cover Art - 5: This is one of those cases where I like something but don't have much to say. It's a nice composition and I like the way Superman and Lex look.